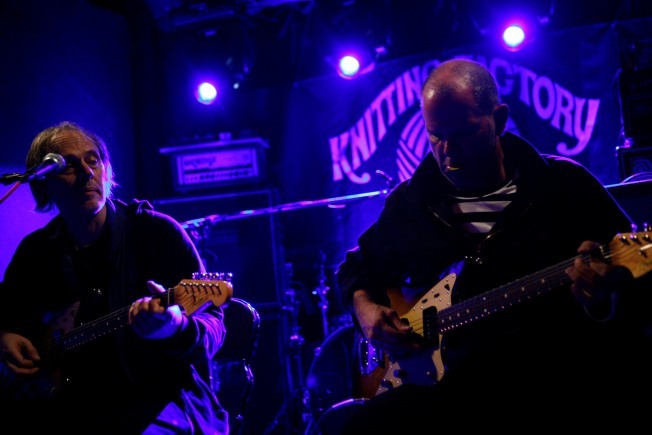 Guitarists Tom Verlaine of Television and Jimmy Rip attend the "Fender Jazzmaster 50th Anniversary Concert" at the Knitting Factory on September 12, 2008. The Knitting Factory is quickly approaching it's last days on the western side of the east river, as it will soon be moving to the old Luna Lounge on Roebling and Metropolitan Ave. in Williamsburg. It's last show on Leonard St. in Manhattanwill be New Years Eve. According to a recent NYPress article, venue management didn't waste anytime in getting started with their out-with-the-old, in-with-the-new plans. Gothamist said everybody was told back in April that they'd all lose their jobs once Jared Hoffman decided on a new space and could "start fresh". That new space became the old Luna Lounge, which closed back in April with reasons stemming from a Dept. of Health shutdown, to the strength of competition in the Williamsburg Music Hall and the former Galapagos space (which has since moved south to Dumbo). The good news is this heartless cleansing may not be true, as one commenter notes, "We all knew that the building had been sold and that the Knit's lease was ending. The letter did not fire us - to the contrary it said that we were all in together until the end.... and that the club would remain fully staffed up to the day we closed. I think that is pretty cool actually - if they were bastards they would have been cutting right and left." The new spot in Williamsburg is smaller than the old, so it's likely that the lay-offs are just a matter of space, and the need for less workers. The commenter adds, "What can you do - we all knew the end was coming - just wish there were more jobs at the new spot."